Maybe the biggest change to Libya's political geography situation since last year has been the Toubou militias' realignment. Until this May, they were loosely allied with the eastern government's "Libyan National Army" (LNA), but after the LNA began supporting their opponents in the city of Sabha, they turned against the eastern government and have leaned more towards the western government in Tripoli. Also, just last month, the LNA eliminated an enclave of rival control in eastern city of Derna, which had been controlled by an independent armed group often accused of having ties to Al Qaeda. 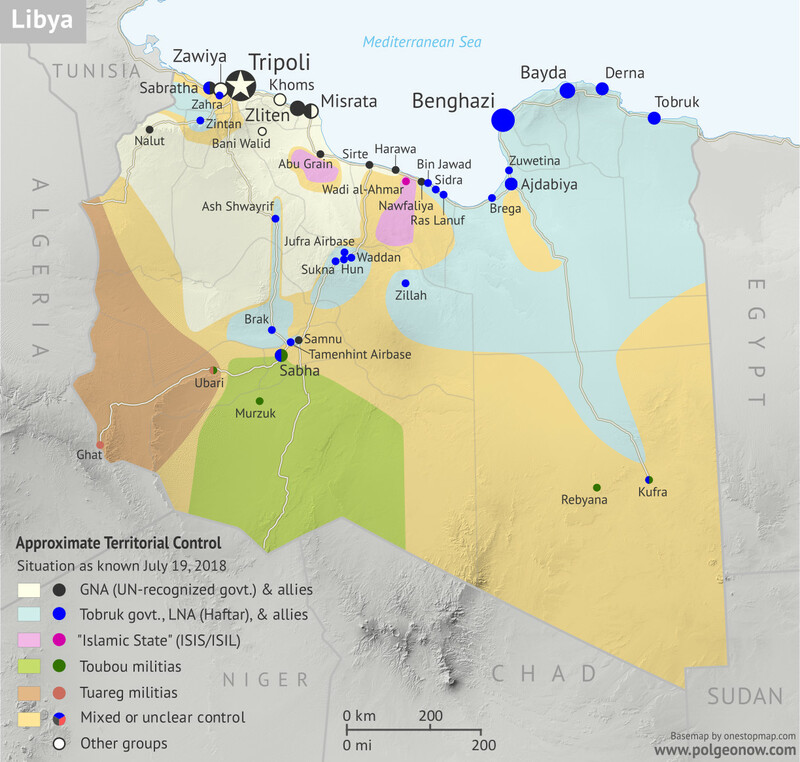 For a full explanation of Libya's rival governments and major armed groups, including the history of the current civil war since the fall of Muammar Gaddafi in 2011, see our detailed Libya background article and timeline from August 2015. You can see subsequent updates from 2015 to present by viewing all Libya articles. The following is a detailed timeline of major political events and changes to territorial control since our previous Libya map report of September 20, 2017. Clashes resumed between two opposing groups in Sabratha, west of Tripoli, after negotiations collapsed. The fighting pitted a group called the Anti-ISIS Operations Room (AIOR) and its allies on one side, against the Anas al-Dabbashi brigade, which had been called major facilitator of migrant smuggling, but recently said it had reached a deal with the UN-backed Government of National Accord (GNA) in Tripoli to stop boats from leaving to Europe across the Mediterranean sea. The al-Dabbashi brigade said it was targeted by opponents who wanted to continue smuggling, while the AIOR claimed its rivals were “jihadists”. Some reports said the fighting came as a result of an Italian-backed deal to fund militias as police forces against migrants. On 23 September, the AOIR captured the downtown Qamar Hotel, while on 28 September, it seized the famous Sabratha Roman ruins, a UNESCO world heritage site. On October 6, the AOIR took full control of Sabratha. Both the GNA and the Benghazi-based Libyan National Army (LNA) have claimed links to the AOIR and both welcomed the group’s capture of the city. The three weeks of fighting left at least 43 people dead and 340 wounded. After holding out for four months in Benghazi, the last fighters of the religious hardline Benghazi Revolutionaries’ Shura Council (BRSC) in the city came under renewed attack from the LNA. Airstrikes were carried out against the fighters for the first time in weeks, along with a ground assault, after the LNA abandoned its attempts to starve them out. It was said only a few buildings remained under BRSC control. However, the LNA's assault met with stiff resistance. Brigades loyal to both the GNA and the LNA started a joint operation in a western district of Tripoli against alleged criminal elements, as well as a militia loyal to deceased Libyan leader Muammar Gaddafi. The district was seized three days later. It was reported that the Sidi Akribesh neighborhood of Benghazi, the location of the BRSC holdouts, had come under control of the LNA. However, two days later, it was confirmed that fighting in the neighborhood was still continuing. It was reported that 10 BRSC fighters and 7 LNA soldiers had been killed in fighting in Benghazi in November. The LNA announced it had taken full control of Benghazi's Sidi Akribesh neighborhood from the hardline fighters. However, the following day, it was said that clearing operations were still continuing in the area. The area was secured and the operations concluded on December 30, after five hardline fighters were killed. Overall, 17 LNA soldiers had been killed throughout December in the clashes, while another 76 had been wounded. Some reported that remaining BRSC fighters managed to retreat to Derna, the LNA denied this. The Mitiga airport in Tripoli was shut down after a GNA-allied group repelled an attack by a rival militia. Several planes at the airport were damaged in the fighting, which left at least 20 people dead. Twin car bombings targeting the Bayaat al-Radwan mosque in Benghazi left 35 people dead. Senior security officers were among the casualties, including Ahmed al-Feitouri, head of the LNA’s investigations and arrests unit. Fighting erupted in the southern city of Sabha between the Sixth Brigade, composed of members of the Awlad Suleiman tribe, and Toubou militias. The Sixth Brigade had up to then supported the GNA, while the Toubous were nominally linked to the LNA. However, the GNA-loyal commander of the Sixth Brigade was eventually replaced by an LNA commander, after which eastern tribal elders tasked with mediating a truce in Sabha declared the Sixth to be a LNA unit. The LNA then began providing support to the Sixth Brigade, which the GNA had not previously delivered, and the brigade used this to press its advantage against the Toubou militias. The walls of the historic Sabha castle were severely damaged by missile fire during the fighting. A reconciliation agreement was reached between the Toubou and the Zawia tribe in Kufra. The two groups had previously clashed in late 2015. The agreement called for the establishment of a neutral security force in the town. Fighting was temporarily renewed in Sabha, before the situation calmed down again. The first LNA units from Benghazi arrived in Kufra to secure the town. The local LNA unit was mostly made up of members of the Zawia tribe, which had previously been involved in fighting against the Toubou. Sabha’s castle was once again hit by rocket fire. Suicide bombers loyal to the so-called "Islamic State" (IS; formerly ISIS/ISIL) attacked the High National Elections Commission in Tripoli, killing 16 people. Meanwhile, Kufra’s tribes vowed support for the LNA. Fighting was renewed in Sabha. Overall, 18 people had been killed and 86 injured, mostly civilians, since the clashes in the city began in February. The LNA launched an assault on the city of Derna, held by the allegedly religious-hardline Derna Mujahideen Shura Council (DMSC), with clashes erupting in the eastern Fatayeh district. The next day, the LNA captured a point of high ground outside Derna. The DMSC dissolved itself and announced the creation of the Derna Protection Force (DPF), which it said would a moderate group under the command of anti-LNA Libyan army officers. The DMSC was widely considered a religious hardline group with links to Al Qaeda, but its leaders claimed this was a lie spread by the LNA's General Haftar. After a new LNA governor arrived in Sabha, he declared a ceasefire between the Sixth Brigade and the Toubou. At this point the Toubou coalition, which had been drifting away from the LNA, demanded that the new governor say whether the Sixth was an LNA unit. After he confirmed that it was, the Toubou declared war on the LNA and launched a large attack, capturing the Sabha castle. The castle was temporarily recaptured by the Sixth Brigade before the Toubou fighters once again seized it, along with the Sixth’s headquarters, the next day. The Toubou coalition also reopened the road to northern Libya and called on the GNA to secure the city. Since the beginning of May, 31 people had been killed in the fighting in Sabha. The DPF withdrew from the Heela district of Derna. The LNA captured two southwestern suburbs of Derna. It was reported that since the start of the battle for Derna, 20 LNA soldiers had been killed and 35 wounded. The LNA also estimated that more than 100 DMSC/DPF fighters had died and another 100 had surrendered. Meanwhile, an armed group attacked and briefly captured Tamenhint Airbase, northeast of Sabha. The attack was reportedly conducted by either the Benghazi Defence Brigades (BDB), a religious hardline militia, or the Toubou militias. The LNA reached 75 percent control of Derna. The LNA advanced in Derna’s Sheiha district up to the edge of the central Al-Maghar area after multiple airstrikes. This left less than 10 square kilometers remaining under DPF control. A UK-based Arab human rights organization reported that since the start of the battle for Derna, 17 civilians had been killed and about 30 wounded. The hardline Beghazi Defense Brigades (BDB) attacked and captured the Sidra and Ras Lanuf oil ports from the LNA. The LNA conducted a counterattack two days later, reporting that at least 20 BDB fighters and 14 LNA soldiers had been killed in the two-day clashes. The LNA recaptured Sidra and Ras Lanuf. However, the BDB soon launched a counterattack. The BDB, which is said to have links with Al Qaeda, was also supported by mercenaries from the neighboring country of Chad. Four days later, the LNA fully secured the two oil terminals. The LNA assumed full control of Derna after capturing the Al-Maghar district from the DPF. LNA sources said their next target would be gangs and foreign mercenaries in the southern city of Sabha. Following this story? View all Libya maps on PolGeoNow.